Special message from Molly Murphy MacGregor with IMPT news! This is just the beginning of our effort to ensure that August 26. 2020 will be declared as a federal holiday, Many have been waiting to contact their elective representatives until after the November election to begin their lobbying effort. Still, others have already begun and are organizing events, celebrations, and demonstrations throughout the county. Whatever you have decided to do, the National Women’s History Alliance, formerly known as the National Women’s History Project will be with you all the way. In the past, this has been a slow time of the year for us, but that will probably never be true again. With my retirement just 29 months ahead, we are in the depths of planning an extensive transition. We have begun by changing our name to the National Women’s History Alliance which better explains our work and focus. We will emphasize and solidify our work as the national clearinghouse for multicultural women’s history. The name change has become official, but our big announcement will be in January 2019 with the publication and distribution of the 2019 Women’s History Gazette. It is our hope that you will be active in promoting women’s history and even in recruiting new Alliance members. One of the goals of the National Women’s History Alliance is to expand the celebrations of women’s history past March and into the rest of the year. Until after the 2020 Centennial, we will be producing two Gazettes, the first will focus on the year’s theme and honorees (to be celebrated throughout the year) and the second will focus on the importance of the women’s full participation in our democracy. We are excited about all our new plans and we could really use your help. We are in the process of seeking new Board and Committee members. If you would like to participate more closely in the array of activities and promotions we do, please let me know. I would be happy to give you more information depending on your interest and the commitment you would like to make. Please email me at nwhp@nwhp.org. Sending lots of good wishes – Forward Together! 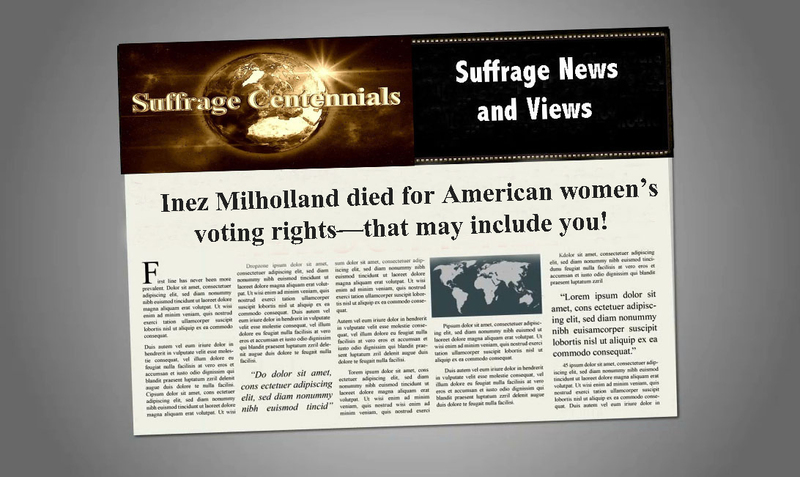 REMEMBER INEZ MILHOLLAND, THE US SUFFRAGE MARTYR! In 2016 the National Women’s History Project honored Inez Milholland with a year long observance of 100 years since her death. Follow the Inez centennial blog. Suffrage Centennials is gearing up for 2020, the centennial of American women voting. It’s also an election year. This entry was posted on September 26, 2018, in Blog and tagged Inez Milholland, Molly Murphy MacGregor, National Women's History Project, suffrage centennials.